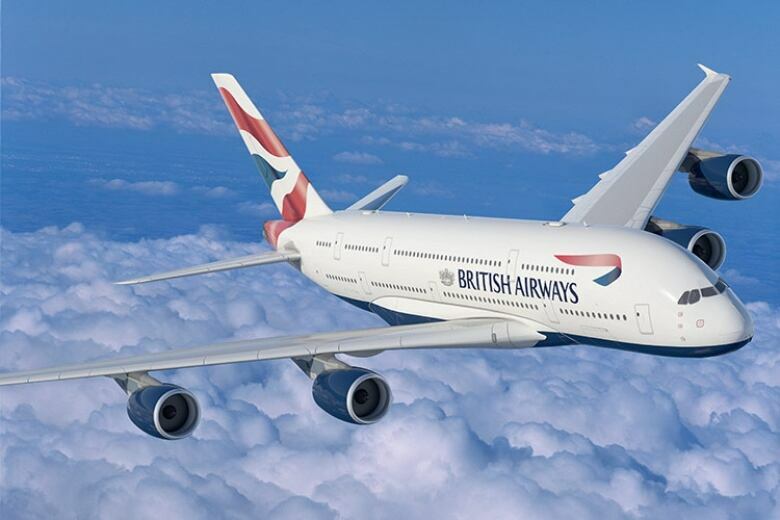 A British Airways A380 aircraft on its way from San Francisco to London made an emergency landing in Vancouver late Monday night after crew members became unwell. A British Airways A380 aircraft on its way from San Francisco to London made an emergency landing in Vancouver late Monday after crew members became unwell, sending 25 to hospital. Flight BA286, carrying about 400 passengers, was surrounded by emergency vehicles shortly after it touched down at Vancouver International Airport around 11:30 p.m. PT. 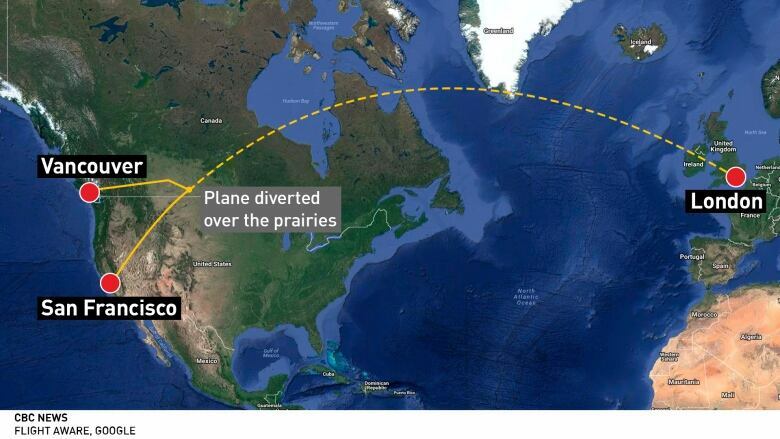 The plane was diverted over the Prairies to land in Vancouver. Initial reports blamed the illnesses on smoke inhalation, but officials have yet to confirm this. It appears all of those hospitalized were cabin crew. "The flight from San Francisco diverted to Vancouver after members of the cabin crew became unwell," said British Airways spokeswoman Michelle Kropf in New York. "We are investigating the cause of the problem." Passenger Steve Lowy told CBC News that about two hours into the flight the crews started quickly clearing away dinner. "They suddenly cleared the trays away, and said that we were going to do a landing in Calgary due to the fact that there was a technical issue with the plane and a number of the cabin staff weren't feeling well." Then the pilot announced that because the plane was an A380 — the largest commercial passenger jet in the world — it would be diverted to Vancouver instead, he said. Despite the concerns, Lowy said he did not notice anything unusual from his seat on the upper deck of the plane. "I gather afterwards there were issues on the lower deck, but you couldn't hear anything or see anything. No alarms going off. I don't think the crew knew a lot about what was going on, or if they did, they didn't want to alarm anyone." "We just sat there in silence, being very British," he said. After the plane landed, paramedics came on board and checked out the crew. One passenger told CBC News the emergency crews that boarded the plane were wearing gas masks. "The whole thing was just a bit odd. There was no information. It was just get through customs and go to the customer service deck," said Lowy. "There was quite a bit of confusion I think from both the ground crew and the crew who weren't feeling well. They said as much as they could in terms of there was a technical fault and some people weren't feeling well." Another passenger, Don Blaser, described the situation as confusing for people on board. "We were kept in the dark.… When we landed what we did know is that the crew got their luggage and left immediately," said Blaser. "We're all sitting there looking around … the entire crew just got up and left the plane... why they took their luggage and left, we have no idea." Health officials in Vancouver confirmed 25 people were taken to three area hospitals and released on Tuesday morning. Ten patients went to Richmond Hospital, another 10 went to the Vancouver General Hospital, and another five went to the Delta Hospital, according to Laura Kohli, a spokeswoman for Vancouver Coastal Health. As of about 5 a.m. PT, the patients at the Richmond Hospital and the Vancouver General Hospital had all been treated and released. The other five patients that were treated at Delta Hospital were also released, Larisa Saunders of Fraser Health said. British Airways was making arrangements for about 400 passengers on the flight to continue their travel, according to Kropf. "Our ground team at Vancouver has arranged hotel accommodation for the customers and will book them on alternative flights as soon as possible," she said. But some passengers took to Twitter to express their frustration about a lack of information and difficulties rebooking flights.